If you're into flavors of the Italian countryside, this meal is for you. It's a melange of earthy portobello mushrooms, loads of spinach bits, chopped asparagus pieces, and big chunks of red bell pepper. 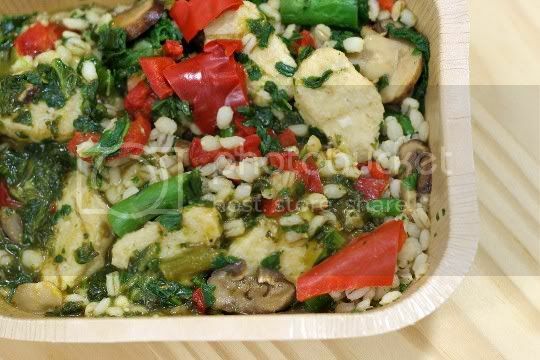 Tender and chewy barley and chunks of salty veggie chicken complete the meal, which is all tossed in a salty, savory, and slightly tangy sauce with hints of tarragon. For me, the red bell peppers (especially in such huge chunks) killed this meal, as I'm usually not a fan of them and that was no different this time. In fact, I think the pepper flavor dominated the entire dish. It's nice-sized and hearty if you're looking for a quick frozen meal at a good value, but if you aren't into bell peppers, try something else (like below...). Now this meal is something to talk about. Salty chicken pieces with thick noodles, carrots, snap peas, yellow bell peppers (these aren't as detestable as the red! ), and crunchy water chestnuts, all tossed in a delicious sweet sauce. On its own, the sauce is surprisingly sweet, but it mellows out and becomes more savory when eaten with the other ingredients. There was also lots of chicken which was nice (although it is a bit artificial tasting), and combined with the noodle amount, this meal makes for a nice portion size. 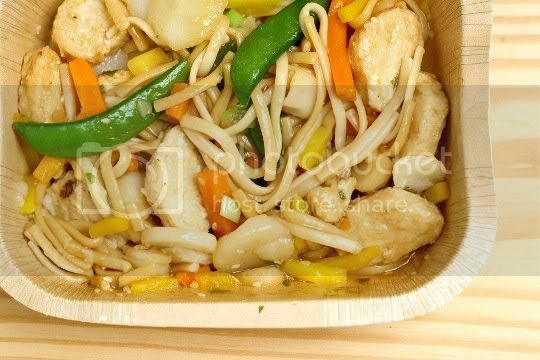 Overall, the meal is very simple, but the taste is quite delicious. I'd definitely keep this on my weekday lunch rotation. These burgers' name rings true: the mushroom flavor is, indeed, very mellow. For me, that's a good thing. 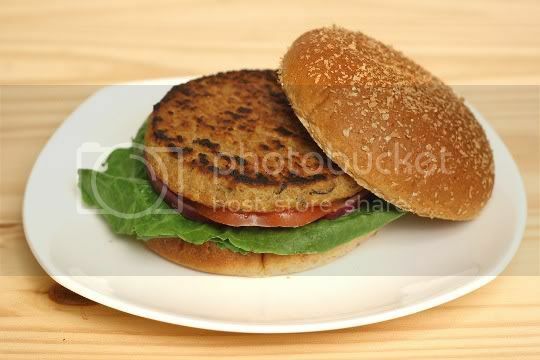 Most times if I'm eating a burger, I want it to be meaty and beefy, not a mouthful of mushrooms. Of course, if you eat one of these by itself, the flavor is much more pronounced. But on a burger with all the trimmings, it turns into a hearty meaty meal. It's well seasoned, slightly peppery and salty. The mushroom flavor that does come through is a nice earthy pairing to the burger's smoky, grilled notes. Oh, and these aren't some puny feeble burgers: these babies are big, strong, and thick, enough to hold up on a grill for some delicious summertime cooking. Pair them with a spicy BBQ sauce to really bring out the flavors. Like the portobello burgers, these are also great in texture. Thick, chewy, meaty, hearty. They are a little bland on their own (i.e., not very salty), so you'll definitely want to include some stellar burger toppings. Aside from that, there are so many flavors to taste: bell pepper (just a hint), tomato, parsley, carrots, and mushrooms. There's whole corn kernels and peas included, which is nice visually. 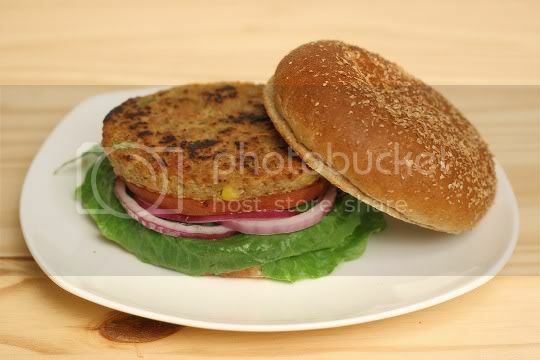 This burger reminds me of a heartier, meatier version of the original Gardenburger, and that's a great thing. I'm glad to see an established company continuing to come out with new and delicious products. 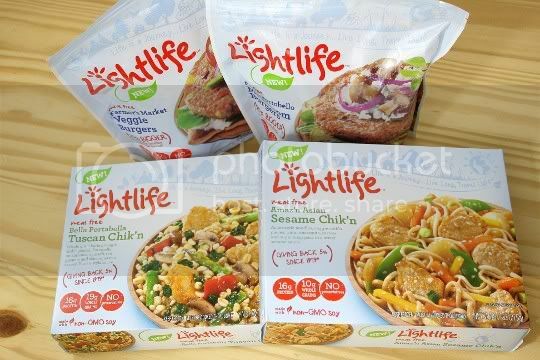 Of course, I'm sure people would like to see more vegan options (especially since Lightlife is so mainstream), but for now the veggies can celebrate! You've really made me want to try the sesame chicken meal. Looks and sounds delicious! I have been using the veggie crumbles for about two years. Heard about them at my Weight Watchers meeting. Mostly use in making chili instead of meat. Very good product!